Allegheny County and the City of Pittsburgh team up to host a “Shred the Packers Rally” on Thursday to rally the Steelers as they get ready to take on the Green Bay Packers for the Super Bowl XLV title. The event begins at noon on Thursday, February 3, on Forbes Avenue and Ross Street in Downtown Pittsburgh. WDVE’s Val Porter will serve as emcee of the event, and Bon Journey and Kardaz will provide live music. Steelers mascot Steely McBeam will also help to rally the crowd. Free Steelers giveaways will be provided by the Steelers and Hometowne Sports. Black & gold schools, Thomas Jefferson, Pittsburgh Brashear, and Gateway, will help to get the crowd ready with cheers or marching bands. Art students from Thomas Jefferson will provide complimentary face painting. Several businesses will provide complimentary food or refreshments on a first-come, first-serve basis, including: hot dogs, Silver Star Meats; ‘Burgh Iced Tea, Colteryahn’s Dairy Tea available at CoGo’s; and black & gold cookies, Eat n’Park. In addition, Coke and GSP will be passing out Coke and water as they promote their “Coke Cheers” contest, which benefits the Boys & Girls Club of Western Pennsylvania and the Sarah Heinz House. Those attending the rally are also asked to continue their generous support of the Greater Pittsburgh Community Food Bank by bringing a canned good, non-perishable food item, or cash donation. For printable signs and photos of the Ground the Jets Rally, visit the Allegheny County Special Events Facebook page at www.facebook.com/ACSpecialEvents. We want theSteelers to win to help us get through the rest of this harsh and snowy winter! What would you give for a Terrible Towel? More information about Dave and his towel are available at SteelersTrade. 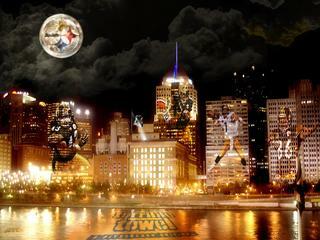 Hello Steelers Nation! My name is Dave Pierce and I am hoping to make a few trades with fellow Steelers fans. 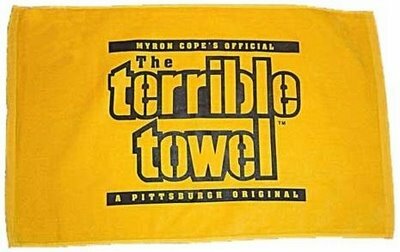 I will start with a Terrible Towel and look to constantly make a trade to get a new Steelers item in return for my old item. The goal in the end is to trade up for Steelers Season tickets.